This month, it was my pleasure to have another chance to interview the lovely Nancy Goldstone, author of The Maid and the Queen: The Secret History of Joan of Arc. 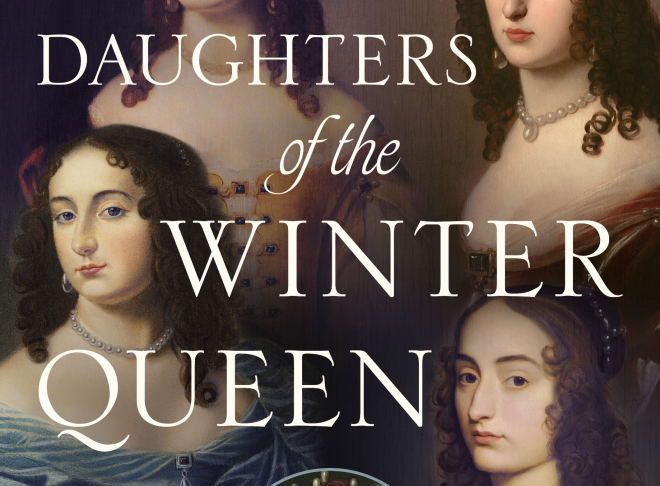 Nancy’s new book Daughters of the Winter Queen: Four Remarkable Sisters, the Crown of Bohemia, and the Enduring Legacy of Mary, Queen of Scots moves us forward into the seventeenth century, exploring the fascinating life of Elizabeth Stuart, the near-forgotten daughter of James I. Read on to find out more about the book, amazing women in history, and Elizabeth’s connection to the royal wedding. For this book, you’re working in a whole new era. How did it feel to spend time in the seventeenth century? Do you think you’ll come back to the Middle Ages? I loved researching and writing about the seventeenth century—it was like one of those 1,000 piece jigsaw puzzles that take time and patience to put together but are so worth the effort because when you’ve finally worked it all out you are rewarded with an amazingly intricate, compelling image. Also, because the Thirty Years’ War is so confusing, very few people know anything about it, including who won. That made writing the story all the more suspenseful. Imagine reading a book about World War II and not knowing that Germany lost. As for the Middle Ages, the Thirty Years’ War felt so much like the Hundred Years’ War—the repeated attacks on the same territory, the shifting alliances, the endless political intrigues—that I often felt that I was in the fifteenth century, and not the seventeenth! The weapons were a little more accurate and destructive and the necklines on the dresses more revealing but the values and behavior of the various combatants were pretty much the same. You say on your website that you “stumbled across” Elizabeth Stuart’s story. Where did you first come across her? After I wrote The Maid and the Queen, about Joan of Arc, I took a little break and just read biographies of high-born women I’d never heard of. I’d been poking around in used bookstores for these kinds of histories for years, so I had quite a collection just lying around the house. One of the books I’d found and never had time to read before was called Five Stuart Princesses, edited by Robert S. Rait, a Fellow at Oxford, published in 1908. Elizabeth Stuart was one of the princesses and I remember being gripped by the condensed version of her story. I knew I would eventually try to write about her because I really wanted to know more. Your book features at least five influential women – Elizabeth Stuart and her daughters Elizabeth, Louise, Henrietta, and Sophia – as well as the shadows of Mary, Queen of Scots and Elizabeth I. Was there one woman’s narrative that really resonated with you? I don’t generally like to play favorites with my subjects, they were all remarkable. But I will admit that Sophia was the most fun to write about. Not only did she have a sparkling sense of humor but also the most amusing (and outrageous) domestic episodes always seemed to happen to her. For example, Sophia was present when her eldest brother’s marriage disintegrated in a truly spectacular way, with his wife going after him with a pistol after she discovered him with her lady-in-waiting (no one was hurt). Stories like this provided some welcome comic relief in the narrative! It’s interesting that some of the major figures in history (Louis XIV, Guy Fawkes, and Descartes in this book) are minor characters in your stories of great women. Do you feel it’s comparable to the way that these powerful women have figured in most retellings? I think that’s exactly right. Princess Elizabeth appears not at all, or as a minor figure, in most biographies of Descartes but once you look at their relationship from her perspective you see how important she was to his career and to the dissemination of his ideas, particularly in Germany. For example, if she had not championed his work, Descartes’s books would not have been available at the University of Leipsic when Leibniz attended. And if they weren’t there, Leibniz would not have been able to read them and change his major from history to mathematics and philosophy, which is what launched him on his career. Research that ignores or downplays female participation doesn’t make these sort of connections. You specialize in, as you say on your website – and I love this – “forgotten women of incredible courage”. Who’s next on your radar? Bonus question: What’s Elizabeth Stuart’s connection to the royal wedding? The current British royal family—the same one Meghan Markle is marrying into next month—is descended in an unbroken line from Elizabeth Stuart through her youngest daughter, Sophia of Hanover. This was not a passive inheritance. Sophia went out and negotiated for the succession. In doing so, she leapfrogged over dozens of candidates who had better claims to the throne than she did. In England, they will tell you that George I inherited the British throne, but this is misleading. It’s not his name on the Act of Settlement, issued on June 22, 1701; it’s his mother’s, Sophia’s. George I couldn’t have negotiated his way out of the bathtub. If it had been up to him, some other family would be occupying Buckingham Palace today, and we would not all have a chance to gossip over what Meghan Markle’s wedding gown will look like.